Tanzania has welcomed nearly 7 million tourists between 2001 and 2012 holiday seasons, attracting a total revenue of 615 billion TZS. Tanzania National Parks (TANAPA) Director General Mr Allan Kijazi has said last year alone there were 945,794 tourists who toured Tanzania, earning for the country 109 billion TZS from the tourism industry in contrast to 2011 when a turnover of 103 billion was generated from 1 million tourists. Mr Kijazi said the 2012 revenue from tourism was the highest so far compared to 15 billion TZS earned for the 2001-2002 seasons when Tanzania received 345 796 tourists. 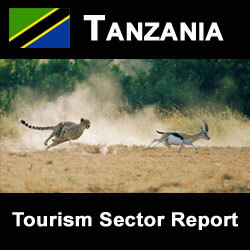 During the 2010-2011 seasons a record number of tourists visited Tanzania. Presently, there are goverment and private efforts to increase tourists visiting Tanzania to 2 million for 2013-2014 season with strategic implementation of effective and quicker visa processing, competitive booking arrangements and tourism development initiatives. As a result of these initiatives for the Tourism Sector, Tanzania will see increased tourism, more business ventures and tax revenues.